If you are an expat living in Spain who wants to start a business but doesn’t know how, then this post is for you. 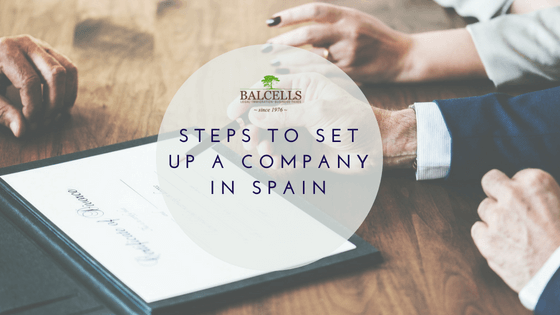 Get ready to learn which are the steps to set up a company in Spain as a foreigner. Your business is closer to you than what you may think! Before Starting: Which Type of Company Type Should You Choose? Before starting the process of constituting a company, we must decide which will be its type. Self-employed. If you are an entrepreneur planning to conduct your activity on your own, this may be your best choice. The main upside is that there is no capital requirement for its constitution. Nevertheless, you will be fully responsible/liable for all the obligations of your operations. In terms of taxes, the self-employed individual will pay income tax. For whom is this structure for? For painters, web designers,… For those individuals whose activity does not require a company for its undertaking, as the work freelancers do. Private Limited Liability Company (Sociedad Limitada). This is, without any doubt, the most popular firm structure in the Spanish territory. Why? Because of its flexibility and easiness in the registration process, just demanding 3.000€ for the constitution process. If you foresee that you are going to make over 60.000€ in sales, directly constitute a company instead of establishing yourself as a self-employed worker. Public Limited Liability Company (Sociedad Anónima). This structure is reserved for big corporations who trade with stocks. It is characterized by a much more rigid structure, and 60.000€ are needed for its constitution. Both private and public liability companies will pay corporate taxes. There is a generalized misconception that we must tackle here. Many times we mistakenly assume that the word “autonomo” and self-employed are the same. And it’s wrong. Because an autonomo is two things: a freelancer and the administrator of a company. On the other side, a freelancer or self-employed does not administrate the company necessarily. The first thing to do as a foreigner is to get your NIE number. It is an identification number that will allow you to open a bank account, be tax identified, etc. The NIE is the most important thing in order to freely operate in Spain. Applying and getting the NIE is a really simple process. The amount of time in which you can obtain it will depend on whether if you are an EU citizen or not: it takes 3 to 5 working days to obtain the NIE number for Non-EU citizens, and the time period for the EU ones will vary depending on the corresponding Immigration Office. If you are from a European Union country, you can just get your green card and it will be enough to start your business in the country. But, If you are from outside the area, having a residence permit will be compulsory. For example, if you start your company as a self-employed, you will need a work permit. If you are from Andorra, Switzerland or a country from the EU, you already have a work permit due to the Schengen agreements. In that sense, the first thing you must to in order to register yourself as a self-employed is to fill and submit the model 037 (the simplified version of the 036). In that document, you declare the activity you would like to perform specifically. Then, you must register yourself on social security, and proceed to start presenting taxes. You need to make a list of 3 names you would like to give to your company. They must be sent to the Corporate Register of Spain (Registro Mercantil) in order to check their availability. If available, they will accept one of the three, depending on the preferences you set beforehand when submitting them. This process can take up to 48 hours. This will be the official name of the company, which will appear on your invoices and other documents. Nevertheless, you can ask the registry for an additional name to be used in other non-legal situations or purposes. Now that you already have your NIE, you can easily open a bank account in Spain. Assuming you chose to start a Limited Liability Company, you are required to contribute with 3.000€ in cash for the constitution of the firm, which you will need to have on a deposit in the newly created account. For sure this is not money lost and can be used in the firm daily operations. The contribution of that amount of money generates a bank certificate that demonstrates the payment. You must bring this document to the notary on the actual constitution day. And what happens if you don’t have that amount of money? You can also use assets that are valued the same to work as capital. For example, you can use your computer, phone or any other asset that is similar and that can sum up to that amount. Nevertheless, that is something we do not recommend. Why? Because afterward, if you would like to sell the shares of the company or divide the capital of the firm for the different shareholders, you will have a much more difficult time than if you used cash. At this point, we need to decide how many and who will be the shareholders of the company. Besides, determining who the director of the company will be is a required step. In that sense, there are two different types of directors. First of all, we find the corporate director (“director mercantil”). He doesn’t need to have a salary or a work permit, and once a year he needs to sign the annual accounting of the company. Having this type of director implies that you will also need to have one worker under your structure, as the Spanish legislation requires. But what many companies actually do is to have one director with corporate and working functions altogether, so the need to have an employee is eliminated. With all the previously mentioned documents (NIE number, the bank certificate and the certificate from the Registro Mercantil), you now need to go to the notary to sign the deed. There, you will establish who are the investors/shareholders and the administrator. Furthermore, you will need to introduce an address. Also, you will need to clearly define which is the activity of the company. Our advice here is to be as open as possible: putting all the activities related to what you are going to do. That is crucial in order to avoid going again to the notary in the future if you expand your business or pivot the activity. If you rely on us for the whole process of starting a company in the Spanish Territory, we will coordinate and represent you in the notary, getting all the required appointments with the different legal institutions that appear among all the steps. Then, the notary will register the company in the Company Register. This process can take up to 3 weeks. Nevertheless, from the day we sign the set up of the company at the notary, they will give you a provisional VAT number, with which you can start your activity. Now that you have obtained the deed from the notary, you should go to the Spanish Tax Agency (Agencia Tributaria) in order to register that documentation and apply for a provisional Tax Identification Number for the company. Bear in mind that you will start paying taxes once when you start your activity. As a self-employed, you will pay personal income tax on your income. Depending on the amount of income you generate, the percentage applied to you will differ. We are talking about a progressive tax. In regards to social security, during the first 6 months, you will just pay 50€. From then, it will progressively grow to 320€. Nevertheless, there are some bonifications that will reduce your taxable income depending on your age. There are bonifications for those under 28 and for those under 32 years old. You will need to do VAT declarations quarterly, therefore having an accountant that manages this procedure for you is highly adivsable. This has been a guide for expats who want to start their business in the Spanish Territory. You will face 6 easy steps in order to set up your company, but it can get a bit tedious sometimes. This is why we highly recommend you to contact us in order to let us help you with the overall process. I WANT TO START MY COMPANY NOW!